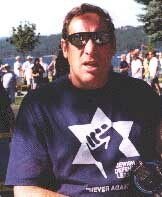 If [JDL chief Irv Rubin] has two previous criminal convictions, of course, he will go to jail for life under California's three-strikes law. HARRY S. phones me from Los Angeles, have I heard the news? No. He says there are two novedades -- Irv Rubin, chief of the Jewish Defense League, was arrested by the FBI in Los Angeles last night with a no less ugly sidekick for having plotted to bomb a mosque in Culver City; and Fox news reports that 60 Israelis have been arrested in the USA as Mossad agents, some of whom are believed to have had prior knowledge of the September 11 attacks. Well whaddy'a know, say I. It will be interesting to see what their buddies on the U.S. media make of these, ahem, awkward stories. The last that I saw of the delightful Mr Rubin (right) was when he and his gang of roughnecks came bulldozing down an aisle at the Los Angeles Militaria show where we had a stand in October 1998; he confronted first bookseller Lance Frickensmith (World War II Books), then my stand; he snarled and shouted and huffed and puffed, and then, as Frickensmith bravely came up snapping at him like a terrier who should know better, Mr Rubin withdrew shouting at me: "We'll be back. We'll kill ya!" Frickensmith ran after him wagging his finger and shouting, "I heard that, and I am a witness." So far as I can detect, Rubin did not live up to his promise. I am still around but, if guilty, Rubin is not. In fact he may well go to jail for a long time, perhaps even the rest of his life, as this bomb-manufacturing thing is, if proven, clearly a Hate Crime; which multiplies the mandatory sentence to be imposed by many factors. Possession of explosives with intent to commit a felony carries a mandatory 30 year minimum. If he has two previous criminal convictions, of course, he will go to jail for life under California's "three-strikes" law. The Christian in me feels slightly sorry for him. There is something perhaps genetically wrong with his mental and chemical make-up, a kind of psychological Gautier's or Tay-Sach Disease. He seems to have enjoyed a life inspired by hatred of others whom he regards as inferior -- the very archetype of a nazi. It would be interesting to hear what a neutral psychiatrist would make of him. The problem is, it would be hard, in this country at least, to find one who was not of the same religious bent. His only defence would seem to be entrapment. As I watch on CNN the two p.m. press conference given by the Los Angeles police and secret service authorities, it becomes evident that the man who provided Irv Rubin (regrettably, they call him "Irving" throughout the press conference) and his accomplice Earl Krugel with the plot, locations, plans, maps, and photographs of the Culver City mosque that was to be the target, and -- as recently as last night -- with the two 2-inch by 12-inch metal pipes, explosive powder and trigger-devices, was, or became just in time, an FBI informant. Rubin is as ugly as sin (even Simon Wiesenthal would have to agree that); of that there is no doubt. But he is also innocent until proven guilty, as they say; so, well, we shall see.